On March 5th, Angelenos celebrated the opening of the new Metro Gold Line extension into Asuza, which expands the existing Gold Line more than 11 miles to bring more people into the ever growing Metro rail system. Later this year, Metro’s rail system will offer even more connectivity options for our choosing. With the completion of Metro’s Expo Line Phase II, expected to open May 2016, people will be able to ride the train from the existing Expo Line Phase I terminus in Culver City all the way to the beach in Santa Monica! In the meantime, LADOT is working diligently on building the Expo Bike Path that largely parallels the Expo Line’s rail line alignment.The Expo Bike Path will provide a low-stress east-west facility for people to bicycle, walk, scoot, or roll. Due to setbacks outside the City’s control, a portion of the bike path has been delayed, public meetings have been previously held with the community, and in January 2016 the City of LA held an open house to provide information and discuss design alternatives. The Expo Northvale Gap Closure project would create a safe and comfortable connection for people traveling on bicycle between a gap along the planned Expo Bike Path. This project would better connect the surrounding neighborhoods to the new light rail line and allow more continuous bicycle travel in West Los Angeles. As part of efforts to close the “Northvale Gap”, on January 13, 2016 LADOT partnered with the Department of Public Works’ Bureau of Engineering (BOE), Department of City Planning (DCP), and Council District 5 (CD 5) to host an open house at the Palms-Rancho Park Branch Library to gather public input on potential alternatives for this gap closure project. The Expo Northvale Gap Closure project is comprised of two segments. 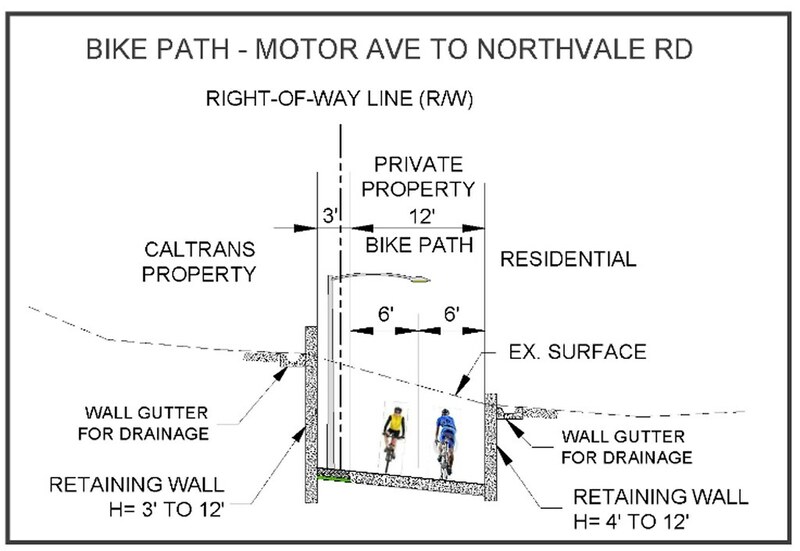 The segment between Motor Avenue and Dunleer Drive, as shown in the cross section below, is planned as an off-street bike path, with access off Motor Avenue just north of the Interstate 10 freeway running along an existing easement and connecting to Northvale Road just east of Dunleer Drive. In Option #1, the two-way bike lanes would run along the south side of Northvale Road, with bollards separating people on bicycles from vehicle travel lanes. Implementing this option would require removal of existing parking on the south side of Northvale Rd., and would require a small amount of roadway repavement. Due to its relatively light construction work, the option is estimated to be the least expensive one out of the three, with an estimated construction cost of $13 million. However, similar safety benefits are expected relative to the other options since bicycle riders will be physically protected from traffic on a local neighborhood street. Members of the public and City staff found the attractiveness of the design alternative given the construction cost considerations, minimal construction, preservation of existing landscaping, facilitation of local access, and similar safety benefits as compared to the other options. Option #2 is similar to Option #1 in that the two-way bike lanes would be positioned at the south side of Northvale Rd. The major difference being that Option #2 would provide a greater level of protection for people traveling on bicycles by creating a concrete curb separating the bikeway and vehicle travel lanes, which requires engineering work to widen the roadway and stabilize its slope. This option is estimated to cost 177% more than Option #1 at $36 million and would require additional loss of trees and open space along Northvale Road to accommodate the widening. This option proposes to construct a bike path in the trench along the train track for the second segment of the project, rather than placing it at street level on Northvale Road. Advantages of this approach are that street parking would not be removed and that complete separation of the bikeway would allow uninterrupted bike travel. However, the implementation of this alternative would restrict access between Motor Avenue and Putney Road. In addition, more local trees would have to be removed, there are concerns for public safety due to the bike path’s below grade location, and project estimates would increase four times compared to Option # 1 (estimated cost of Option #3 is $52 million). While we are trying our best to close bike path gap as soon as possible, an interim route will be needed while the gap closure project is in design and under construction. The planned interim route for people on bicycles is shown above, “Bike Route” signage, “Sharrows” and other wayfinding (traffic control) measures will be applied to this route to guide users. To understand current use of street parking, our engineers conducted field investigation during weekday midday, weekday PM, weekend AM and weekend PM. Data about the number of cars parked on street were collected along Northvale Road during the four time periods, and the information was provided to the public at the open house. Generally, relatively low parking utilization was observed at the southern portion of the Northvale Road when compared to the northern portion of the street, between Dunleer Drive and Overland Avenue. We are grateful to have received plenty of feedback regarding all aspects of this gap closure project. Seventy-eight written comments were received during the public open house and ten comments were received separately via email. While some residents conveyed their concerns about the potential impacts of this project, most people who submitted their feedback support the closure of this critical gap via the bike path. Based on comments received, there was a lot of support for Option #1, since it was perceived to be most cost effective and would require less removal of trees and landscaping than Option #2 or Option #3. People also prefer this option because it is more likely to be implemented more quickly than the alternatives. Some comments expressed support for Option #2 and Option #3 for their increased separation from motorized vehicles, but were also concerned that those two options would require greater tree removal and greater cost. Many residents addressed the importance of preserving local landscape and the nesting habitat in order to maintain the quality of their neighborhood. Some residents are concerned that the removal of some parking spaces on Northvale Road would cause inconvenience for the residents who live nearby. Other residents wanted their privacy to be protected from the bike path. Although exact impacts would not be known before design plans are developed, our team appreciated all the concerns and comments shared and we will take them into account during the specific design and implementation stages of the project. Based on recommendations from the public input received during the open house meeting and the Council Office, and considerations related to access and safety benefits, project costs, and design feasibility, LADOT and BOE have decided to further develop the Option #1 design. Option #1 is the most cost-effective option in satisfying the project goals and is most feasible in terms of securing additional funding. It would bring less construction activity to the neighborhood and is more promising to allow for the closure of the bikeway gap and full build-out of the Expo Bike Path in a timely manner. We heard the importance of preserving local landscape, and ensuring the safety of the interim route for all users, and understand that some concerns persist with reducing on street parking on the south side of Northvale Rd. While working with BOE to develop the specific design, we will take all the concerns and suggestions into consideration. Updates about the project will be provided once we have more detailed information about the cost and impacts of the project. Thank you again for those who attended the meeting and contributed to the discussion of this project! We look forward to bringing high quality facilities for people on bicycles to Cheviot Hills and Palms, which will better serve the community.